Red miso. Now before you accuse me of unoriginality (given my last miso project), hear me out– miso isn’t just salty, it’s also caramel-y in flavor, adding a subtle note of umami to the whole pie. 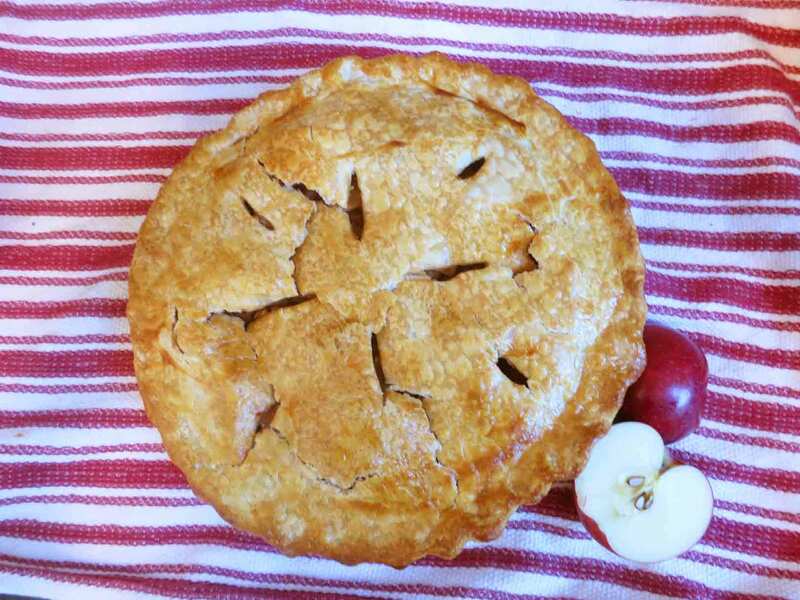 It works fantastically with the apples, and makes the overall flavor just a bit more complex than the standard apple pie. So it’s not just a case of me having extra miso on hand and trying to use it up in anything that comes to mind. I promise! I knew I wanted to really pack in the apples for this one, so I borrowed a technique from America’s Test Kitchen and cooked my five pounds of sliced apples down a bit before draining them and loading them into the crust– this gets rid of some of the juices, keeping the bottom crust from getting soggy, and avoids the whole issue of the apples shrinking a bit as they cook, preventing the top crust from falling in after baking. As for the crust, I’ll be the first to admit that when it comes to pie crust, I rarely make my own. It never seems to roll out well, the butter always oozes out during baking and makes the whole thing shrink, and it’s just a lot of trouble. So I use Pillsbury for regular pies (tarts and slab pies are different, as you may see later). It’s consistently good, easy to work with, and relatively inexpensive, leaving me free to get creative with fillings! 1. Place a foil-lined baking sheet on the lowest oven rack and preheat oven to 425 degrees F.
2. 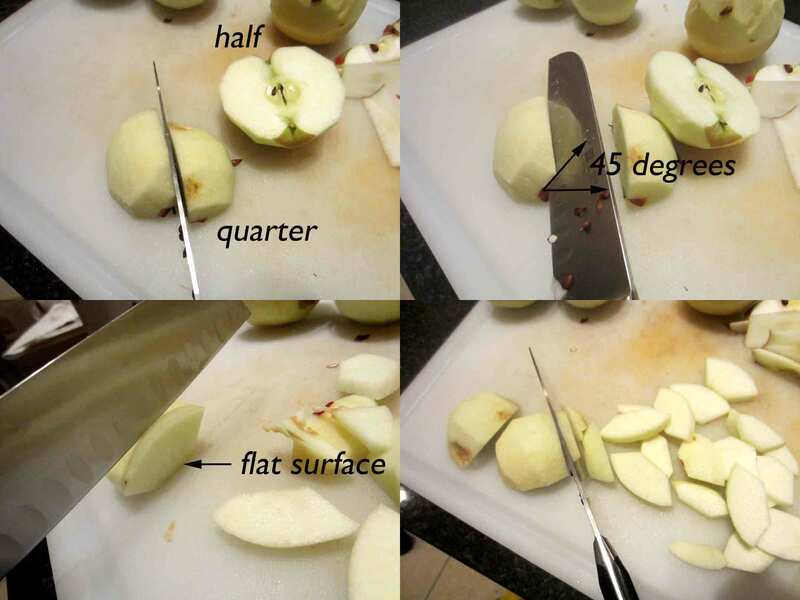 Peel apples and slice into 1/4″ slices. 3. Toss apple slices which sugars, spices, and miso paste. Cook in a large pot over medium-high heat, covered, for 15-20 minutes, until just tender. 4. Drain apples in a colander, reserving the juices in a bowl. Spread apples out on a cookie sheet or pan to cool to room temperature. 5. Return reserved juices to the pot and bring to a boil, cooking down until thick and syrupy. Cool to room temperature. 6. Pour syrup over apples and stir to combine. 7. 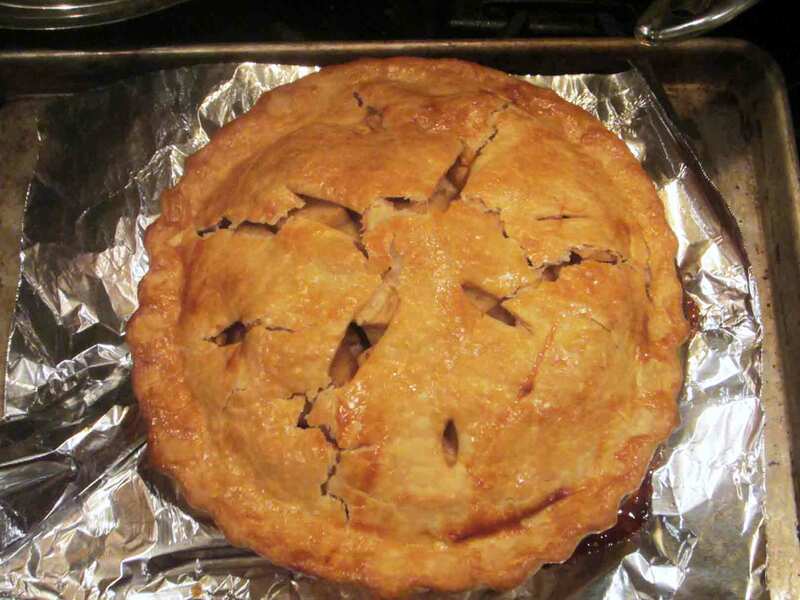 Line a pie pan with one crust, add apples, and top with the second crust. Crimp edges and cut vents in the top. 8. Beat the egg thoroughly, and brush over the top of the pie. Do not seal vents! 9. Bake at 425 for 15 minutes, then lower oven temperature to 375 and bake another 40-50 minutes, until top turns golden brown and there are lots of juices bubbling out the vents in the top. Cool at least 1 hour before serving. 1. usually like to slice my apples on a mandoline slicer, but I’ve lost the “thick slices” attachment that lets me cut 1/4″ thick so I did it by hand this time. 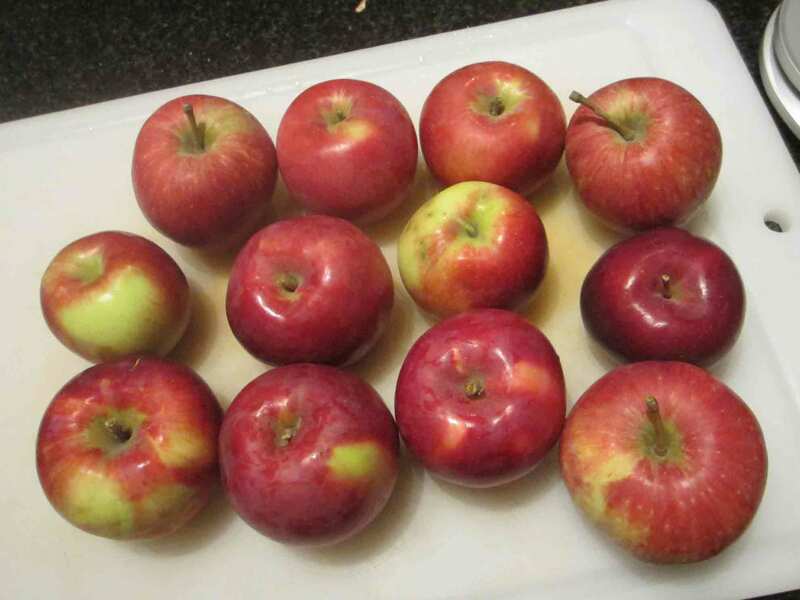 My favorite (easiest and safest) way to do it is this: Cut peeled apples in half, then quarters. Slicing at a 45 degree angle, cut out the center core section of each quarter, cutting parallel to the core. Tip the apple over onto the surface you just created, and spin it (flat) 90 degrees. You are now cutting perpendicular to the core section, or parallel to the “equator” of the original apple. Cut 1/4″ thick slices. The beauty of this technique is that your slices are the same thickness all the way through (rather than being wedges), and you’re always cutting on a flat surface so you have less risk of injury. 2. 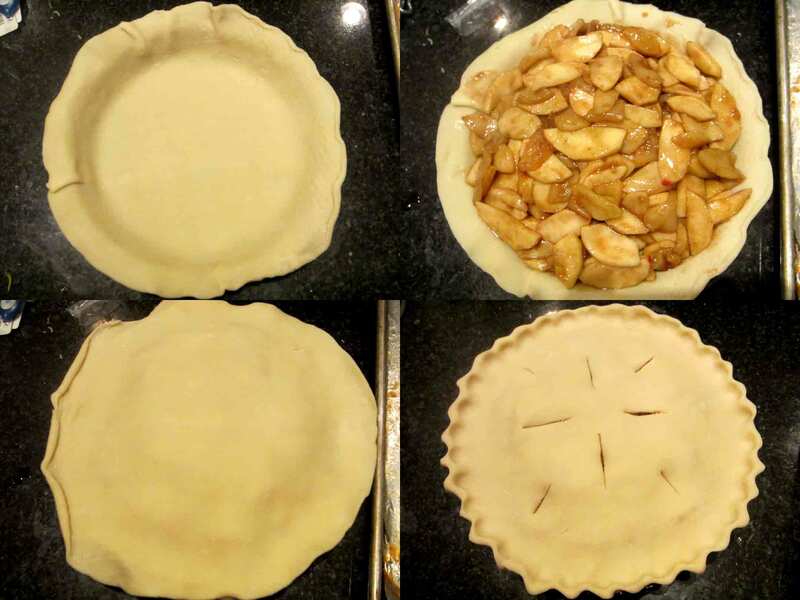 You really do want to use the foil-lined baking sheet under your pie in the oven– the baking sheet not only conducts heat better than the plain oven rack, but it also catches the inevitable bubbly mess that will ooze out of your pie during baking. It’s a big mess. And it’ll burn onto your sheet pan if you go without the foil, forming an impenetrable black mass of crusted sugar that takes no end of soaking and scrubbing to remove. Trust me. 3. I admit it, the recipe above was not exactly the recipe I used. The pie I actually made had slightly less sugar and less miso than listed– but in my opinion it wasn’t sweet enough, and the miso (while marginally noticeable) could’ve been stronger. I increased the ingredients so that if you try it, you hopefully get what I’d intended the pie to taste like. 4. You could probably increase the amount of apples to 6 lbs, since 5 lbs didn’t make the gigantic pie I expected once the apples cooked down. If you do, increase the spices, sugar, and miso accordingly. I’m really intrigued but the addition of miso paste. I’ve never noticed a caramelly flavour to it before, but I’ll take your word for it. Definitely giving it a try in my next apple pie. soooooo creative! Live the secret ingredient…this is a must try.